Mga Anak ng Araw. 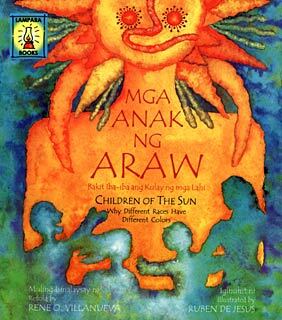 Bakit iba-iba ang Kulay ng mga Lahi (Children of the Sun. Why different races have different Colors) as retold by Rene O. Villanueva and illustrated by Ruben de Jesus. This is the story about Bathala who created a man and woman but forgotten to give them color. Mother sun gave them colors. Written in Tagalog and English. Published by Lampara Publishing House, Manila. ISBN 9715180094. 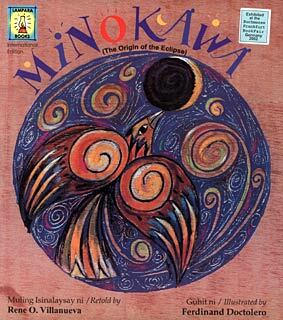 Minokawa (The Origin of the Eclipse) as retold by Rene O. Villanueva and illustrated by Ferdinand Doctolero. This fantastic Bagobo tale from the Southern part of the Philippines tell us about the legend of the Eclipse. A giant bird Minokawa who lives in outer space is devouring the sun and the moon, and trying to do the same with the earth. But the Bagobo people stop him from doing that. Written in Tagalog and English. Published by Lampara Publishing House, Manila. ISBN 971518023X. 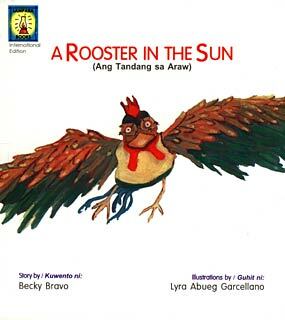 Ang Tandang sa Araw (A Rooster in the Sun) as told by Becky Bravo and illustrated with vivid oil paintings by Lyra Abueg Garcellano. This story tells us why roosters crow at sunrise, and why can't they fly like other birds. Written in English and Tagalog. Published by Lampara Publishing House, Manila. ISBN 9715180310. 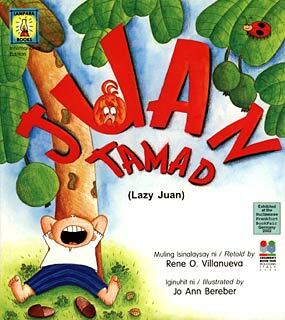 Juan Tamad (Lazy Juan) as retold by Rene O. Villanueva and illustrated by Jo Ann Bereber. This is one of the most popular folk characters in the Philippines. This is a story about the very lazy boy named Juan, whenever his mother ask him to do something he think of an excuses. Written in Tagalog and English. Published by Lampara Publishing House, Manila. ISBN 9715180361. Tubble Wubble. 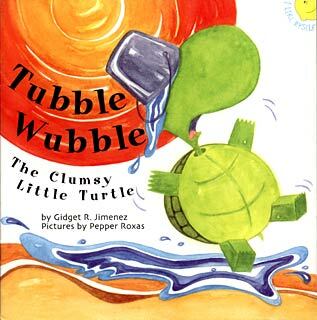 The Clumsy Little Turtle �An I-Like-Myself �book as told by Gidget R. Jimenez and illustrated by Isabel �Pepper� Roxas. This book contain the story of a turtle named Tubble Wubble who is always in trouble but at the end, he finally do the right thing. Written in English only. Published by Tahanan Books for Young Readers, Makati City. ISBN 9789716300994. For the youngest children, plenty of plastic laminated books can be found in most book stores. We list a short selection. 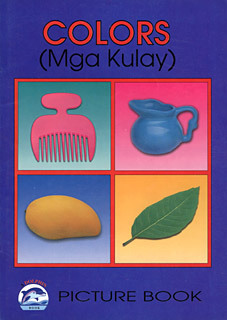 Colors (Mga Kulay) This colorful picture book helps children to learn and identify colors in English and in Tagalog. Published by Sterling Paper Products, Makati City. 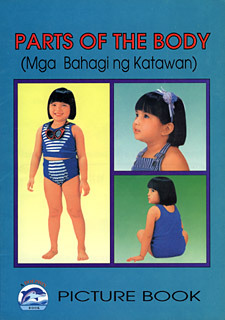 Parts of the Body (Mga Bahagi ng Katawan) This Picture books helps children to learn and identify our body parts in English and in Tagalog. Published by Sterling Paper Products, Makati City. 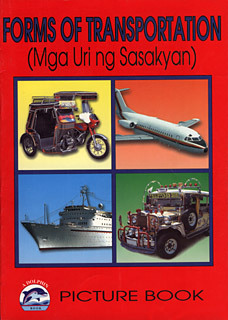 Forms of Transportation (Mga Uri ng Sasakyan) This colorful picture book helps children to learn and identify various types of transportation, as they can be found in the Philippines, in English and in Tagalog. Published by Sterling Paper Products, Makati City. 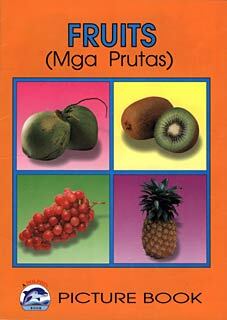 Fruits (mga Prutas) This colorful picture book helps children to learn and identify different variety of Philippine Fruits. They will learn naming fruits in English as well as in Tagalog. Published by Sterling Paper Products, Makati City. I've read paalam swimming pool(goodbye swimming pool) it is really nice and powerful. more power! i already choose one, how could i get copy? i am looking for children's books in the national bookstore for my study about the gender portrayal of children's books. but i found it's difficult to find appropirate book that i could look for the characters which differs in gender representation. how can we contact Lampara Publishing House? we are interested to make business with you.. This is great web-site. How can I get these books in America? your comments on "Philippine Children's Books (Part 3)"